Mount Airy, North Carolina is a city of just over 10,000 people located in the foothills of the beautiful Blue Ridge Mountains in northwest North Carolina. Mayberry RFD icon Andy Griffith grew up in Mount Airy, North Carolina, and it's no coincidence that a stroll down Mount Airy's Main Street reminds people of the town of Mayberry from The Andy Griffith Show. Mount Airy, North Carolina is a great jumping-off point for exploring the Yadkin Valley wine region, the breathtaking Blue Ridge Parkway, multiple state parks within a 45-minute drive, the stunning pinnacle of Pilot Mountain, and/or the nostalgic sound of bluegrass and old-time music. Our lodging facilities are unique and vary from cabins, to camping, hotels, bed and breakfasts, vacation rental homes, and even a stay in Andy Griffith's actual homeplace. We have multiple recreational opportunities including great trout fishing, pond fishing, multiple parks, greenway trails that follow our rivers, hiking, biking opportunities, kayaking, and so much more! Mount Airy is a great place for dining, with hundreds of restaurants, bakeries, country cookin' diners, fine dining, and regional cuisines. We have excellent, award-winning school systems and a community college, Surry Community College, that offers continuing education classes and workshops as well as the North Carolina Center for Viticulture and Enology. Many newcomers love the idea of living in a place where getting to know your neighbors is a must and where living near the Blue Ridge Parkway offers a slice of heaven. It's the perfect place to get lost on country roads and discover general stores and historic diners along the way. We are only minutes from the Virginia border and two hours from major metropolitan cities like Charlotte and Raleigh. Winston-Salem is only 30 minutes to our southeast, and the Piedmont Triad Airport in Greensboro can accommodate almost all desired flight travel. We also have a smaller airport in Mount Airy. There are many shopping opportunities in our area, everything from small specialty boutiques to clothing to furniture and everything in between. Many people enjoy shopping at the many antique shops, consignment shops, and flea markets in the area. Our vibrant, historic downtown attracts thousands of visitors from all over the world each month. Don’t worry about getting lost - we have the friendliest folks around and you will rarely get caught up in anything that feelings feels like big city traffic. 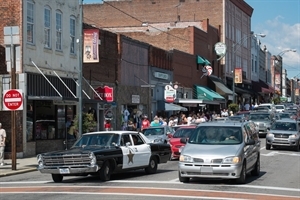 Mount Airy has just over 10,000 residents, making it a SMALL town with a BIG personality! Mount Airy is the North Carolina retirement and relocation destination for those looking for recreation. The town is less than 45-minutes from three state parks and a 15-minute drive from the Blue Ridge Parkway. The city is a walkable town that boasts more than 30 miles of sidewalks (and more built on a regular basis) and 5 city parks. The Emily B. Taylor and Ararat River greenways total just less than 5 miles of multi-purpose paved trails, along two scenic waterways. Both greenway trails are in the process of being connected, with connection completed in 2016. The Ararat River is accessible for fishing and is a stocked, delayed harvest waterway. Westwood Park offers a stocked fishing pond with a handicapped-accessible dock. The city’s parks offer a variety of experiences,a skateboard park, 6 miles of mountain biking trails, 9 holes of disc golf, ball fields, soccer fields, 2 playgrounds and both reservoir and river fishing opportunities. In addition to private fitness facilities, Reeves Community Center, the city recreation headquarters (located one block from historic downtown), is a full-service 50,000 square foot fitness facility with an indoor pool, seasonal outdoor pool, gymnasium, racquetball courts, after-school/camp programs and more than 70 fitness class opportunities offered each week. Adult and youth athletics include a wide variety of sports for all ages. Mount Airy is within a 30-minute drive from seven golf courses, including Primland Golf and Spa Resort, a mountain lodge and golf course that sits on 12,000 acres high in the Virginia Blue Ridge Mountains. Mount Airy offers multiple festivals, including Mayberry Days in September, Autumn Leaves Festival in October, two fiddlers conventions, Art Walks, Farm Fest, and so much more! Mount Airy is known for bluegrass and old-time music with free jam sessions each week and the second-longest-running live radio broadcast in the nation every Saturday morning, WPAQ's Merry-Go-Round. Pilot Mountain State Park is only 10 minutes away, with hiking, camping, fishing and more. Hanging Rock and Stone Mountain State Parks are within a 40 minute drive. The Blue Ridge Parkways is located only 12 minutes away. We have a thriving and beautiful downtown area with multiple unique shops, galleries, museums, and dining opportunities. Mount Airy is located in the heart of the Yadkin Valley Wine Region, with 14 wineries in Surry County, including a winery in Downtown Mount Airy that offers free live music at least twice per week. Mount Airy is well-known around the world for our unique styles of bluegrass and old-time music. The Historic Earle Theatre and Old-Time Music Heritage Hall in Downtown Mount Airy includes exhibits on old-time music and it is the site of the free Thursday-night music lessons and jam sessions. Also, every Saturday at 11 a.m., WPAQ 740 AM, our award-winning bluegrass and old-time radio station, broadcasts a live radio show from the Earle, the Merry-Go-Round - the second-longest-running live radio show in the nation (only next to Grand Old Opry). The Earle also hosts multiple concerts, dances, and films throughout the year. Surry Arts Council operates the theatre, as well as the Blackmon Amphitheatre, the Andy Griffith Museum, and the Andy Griffith Playhouse, with live community theater productions, summer arts camps, beach music multiple times per week in the spring and summer, and arts activities throughout the year for children and adults. We also have 3 amateur theater groups who perform in various venues throughout the year. There are multiple galleries in Mount Airy, including an art gallery and teaching studio in downtown Mount Airy, offering multiple art classes each month. Downtown Mount Airy has at least two Art Walks per year with art-related activities and demonstrations throughout the downtown area. There’s no lack of performing art venues in Mount Airy. There is something going on all the time! If you are looking for a place with tremendous community pride and ample opportunities to get involved, look no further than Mount Airy, NC! Yveddi Public Transportation - buses that travel to nearby Winston-Salem and Greensboro. Also available on an on-call basis for a very low price (vans). We also have the PART bus system that travels to the Mount Airy park and ride lot each morning and evening, with stops at the Greyhound bus terminal in Downtown Winston-Salem, Forsyth Hospital, Baptist Hospital, and other major locations in the Winston-Salem area. Northern Hospital of Surry County is a general medical and surgical hospital in Mount Airy, NC, with 108 beds. Survey data for the latest year available shows that 37,269 patients visited the hospital's emergency room. The hospital had a total of 4,944 admissions. Its physicians performed 1,668 inpatient and 5,660 outpatient surgeries. The hospital offers a variety of services and screenings and is one of the largest employers in Mount Airy. Other specialists from cardiology to dental care are plentifully available. Jan 23.0 F° 35.0 F° 47.0 F° 3.6 "
Feb 26.0 F° 38.5 F° 51.0 F° 3.3 "
Mar 31.0 F° 45.0 F° 59.0 F° 4.1 "
Apr 40.0 F° 54.5 F° 69.0 F° 3.8 "
May 49.0 F° 62.5 F° 76.0 F° 4.3 "
Jun 59.0 F° 71.5 F° 84.0 F° 4.5 "
Jul 63.0 F° 75.0 F° 87.0 F° 5.1 "
Aug 62.0 F° 74.0 F° 86.0 F° 3.9 "
Sep 54.0 F° 67.0 F° 80.0 F° 4.0 "
Oct 42.0 F° 56.0 F° 70.0 F° 3.3 "
Nov 33.0 F° 46.5 F° 60.0 F° 3.5 "
Dec 26.0 F° 37.5 F° 49.0 F° 3.5 "
Mount Airy has four distinct seasons and beautiful weather year-round. We are located in the foothills of the Blue Ridge Mountains. Mount Airy residents enjoy warm summers and mild winters. The average annual temperature is 61 degrees F. The annual winter temperature is 46 degrees F, while the average summer temperature is 76 degrees F. The average annual rainfall is 45.5 inches, and the average annual snowfall is 10.5 inches, making Mount Airy the essential North Carolina retirement, second-home, or relocation destination. Condos Over 50 Communities There are a variety of condominiums throughout the city available for those seeking community living, worry free of maintenance issues. Ridgecrest has been providing resident care for the past 11 years and offers villa homes and assisted living options. Other services are offered and are done with complete resident satisfaction in mind. The Renfro Lofts are in the heart of downtown and are home to a variety of people looking for amenities that are convenient and low in maintenance. New housing opportunities are built on a regular basis, including apartments, condos, and new homes. Home care Senior center Visiting nurses YVEDDI operates multiple senior centers in Surry County. The Surry Senior Center in Mount Airy is located in Jones Family Resource Center on Jones School Road. They offer classes, enrichment opportunities, social events, day trips, concerts, dances, a drama group, and much more! For more information, call the Jones Family Resource Center in Mount Airy North Carolina.